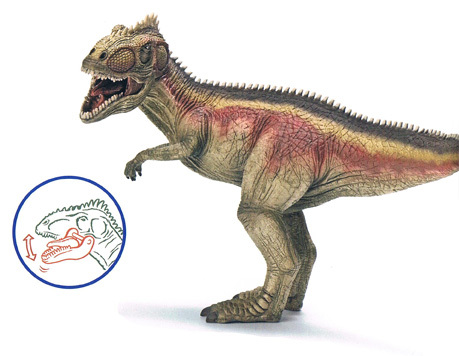 The French based figure and model manufacturer Papo have announced their new prehistoric animal models for 2012. Papo market their prehistoric animals under the “Dinosaures” brand, with the introduction of a total of seven new replicas, three of which are not dinosaurs, it may be time for Papo to extend this umbrella branding to include “animaux préhistoriques”. The high standards that collectors have come to expect from Papo have been maintained, and the new introductions brings the total model range to twenty-five (including the two cavemen figures). There are a couple of retirements. Firstly, the camp fire that we at Everything Dinosaur sold along with the two cavemen figures, this is being retired and we don’t think any more will be available. In addition, the award winning T. rex with its moving lower jaw is being replaced by a re-painted version – a sort of T. rex with a makeover, the colour scheme will be predominately light brown. Award winning T. rex with a new look. It is fascinating to see how Papo’s designers are modifying their range of prehistoric animal models. This T. rex has been one of the company’s “flag ship” replicas, and it has proved to be a top selling sculpt over the years. The re-paint is interesting, with its subtle stripes and dusky colours, perhaps a homage to the origins of the really big Late Cretaceous Tyrannosaurs which are believed to have originated from the dry and dusky interior of China, before they migrated into North America. This model will be available from Everything Dinosaur in February. Tyrannosaurs have certainly been at the centre of Papo’s design efforts over the last few months, as hot on the heels of the re-paint, comes a brand new sculpt of an adult Tyrannosaurus and what a monster this is! There are some subtle differences between this new interpretation and the previous model of this iconic dinosaur. The forelimbs have been slightly re-positioned to reflect the latest thinking regarding their position and the lack of pronation that big Theropods had; (the ability to twist their arms and to hold their fingers parallel to the ground). The eye crests are retained but these are joined by a small, raised ridge that runs from the skull down the neck and the dentition (layout of the teeth) has been altered. The model is very well balanced and gives the appearance of movement, with T. rex being depicted as a lean and muscular predator. The first T. rex replica produced by Papo was heavily influenced by the Tyrannosaurus rex that featured in the Jurassic Park film trilogy, our experts at Everything Dinosaur have noticed the influence of another Tyrannosaur seen in recent films, in this new replica – the prominent premaxilla and the large teeth resemble the Tyrannosaur known as Vastatosaurus rex seen in the Peter Jackson re-make of King Kong that came out in 2005. The Vastatosaurus rex was interpreted as being a descendant from the North American Tyrannosaurs, it was the top predator on Skull Island and the only dinosaur brave and strong enough to tackle the giant ape. This new model will be available in February 2012. A homage to recent dinosaur movies? Did this influence the Papo Replica? The Tyrannosaur theme continues with the introduction of two juvenile Tyrannosaurus replicas. The design team at Papo must have been reading up on recently published scientific papers which postulated that Tyrannnosaurs may have been pack hunters, living in small family groups. The recently refurbished and re-opened dinosaur halls at the Los Angeles County Natural History Museum, features an exhibit of three skeletons of T. rex, an adult, a teenager and a juvenile all feeding off the carcase of a dead Edmontosaurus. This is the first time, that Tyrannosaurs have been depicted in a family group. We think that Luis Chiappe, the Director of the Museum’s Dinosaur Halls would be intrigued to see how Papo have interpreted the young T. rexes. Our experts at Everything Dinosaur, think the green T. rex represents a slightly older animal, whereas the brown T. rex is a replica of a much younger animal, perhaps less than a year old, if current ontogeny theory (growth rate) associated with Late Cretaceous Tyrannosaurs is correct. The age of the animal can be estimated by looking at the body proportions, note the size of the head in comparison with the rest of the creature. In both models, the head is raised as if the young creature is looking up at one of its parents, perhaps begging for food or seeking the assurance and protection of an older member of the Tyrannosaur family group. Papo is to be commended for taking the time and trouble to research some of the latest theories regarding Tyrannosaurs and then incorporate this research into their figures. We suspect that just like at the Los Angeles County Museum of Natural History, these T. rex models can be posed so that collectors and dinosaur fans alike can form their own T. rex family group. All the Tyrannosaur models are scheduled to be available from February. 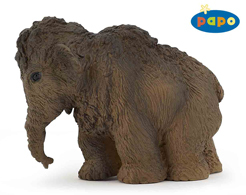 Joining the large Woolly Mammoth available from Papo, comes not one but two baby Mammoths. The trend to feature prehistoric animals in family groups seems to extend from the Tyrannosaurs of the Late Cretaceous right up to last Ice Age with these new Papo models. When team members at Everything Dinosaur first saw this picture, we thought “cute” the vulnerability of a young creature in a harsh environment has really been captured by the Papo model makers. This sculpt reminded us of “Lyuba” the remarkable fossilised Mammoth baby found just a few years ago in Siberia. With the retirement of other hand-painted Mammoth models, these two replicas are very welcome. Note the humps on the back of these young animals. Scientists studying the extremely well-preserved remains of “Lyuba” the youngest Mammoth fossil ever found, discovered that these babies did indeed have a hump on the back. It has been suggested that young Mammoths were able to lay down fat and store it in their bodies, in a similar way to creatures like camels – an adaptation to living in a cold, harsh environment when food supplies were never guaranteed. Marine reptiles are not left out from the new Papo 2012 collection. We had known about the introduction of a replica of the fearsome marine reptile Tylosaurus for some time, now we can put up a picture of this model, which will be available from February. A number of genera of this type of marine reptile are known from the fossil record. The scaly skin on this replica could be Papo’s way of highlighting the affinity this group of predators have with the Squamata (lizards and snakes). Tylosaurs are believed to be closely related to modern monitor lizards, although at over fourteen metres long (some species), these extinct creatures are much larger. It is apt for Papo to introduce a model of a Tylosaurus in 2012, as next year marks the 140th anniversary of the naming of this marine reptile. This model will work well with the existing Papo marine reptile model (Plesiosaurus) that was introduced to the range in 2009. It will be available in February. Last but by no means least, comes the largest model that Papo have made in their “Dinosaures” range. In fact, this will be one of the largest models ever made by Papo, and indeed one of the biggest dinosaur models around. Papo are introducing their first ever Sauropod figure, and what an excellent model it looks to be. Coming out in July 2012, Papo are introducing a model of Brachiosaurus. The more traditional, elephantine colouring will contrast well with other Macronaria models due to be introduced next year. The Brachiosaur is depicted as a very heavy-set, powerful creature and this replica will make an excellent centrepiece for many a collector. It is due to be released in Summer 2012, just in time for the London Games, looks like we are going to need an Olympic-sized warehouse to store all these new models from Papo.